This woodblock print was modeled on an original sumi ink sketch dating from the late 1920s. It would have been one of several which would have been created during the preparation of design number 33 of 楽山花鳥畫譜 Rakuzan Kachou Gafu, lit. 'Rakusan's Flower and Bird Print Series'. In late 1929 Rakusan decided to make simple woodblock prints for use as advertising previews for each of thirty-six upcoming primary designs. To save time he selected a single, representative, alternate composition from among the preliminary sketches for each of those final designs. Regrettably, all of these original sketches are believed to have been lost many years later when Rakusan personally destroyed all of his own sketchbooks. Rakusan called these alternate designs 素描 sobyou, literally 'rough sketches'. Printing of the preview sketch as a woodblock print was accomplished with only two impressions, an initial printing in half-tone gray, and a final one in black (for the details and outlines to remain crisp). Rakusan probably expected the preview prints to be discarded by the recipients - much as most avertising is today. Somewhat surprisingly therefore the preview prints were printed full size on the same, relatively expensive, typical edition I watermarked paper used for the final version prints of the series. The very poor condition of all of the surviving preview prints suggests that Rakusan may have been recycling a batch of damp-damaged paper unsuitable for its originally intended use, but adequate for ephemera. The preview prints were never sold as such but were distributed as free advertising to series subscribers and to early purchasers of prints from the first publication and first printing run of the primary series. Therefore, only a single printing run of fewer than 200 copies of each once existed. Most of those copies have not survived, but fortunately some clients appreciated these now very rare prints and preserved theirs carefully, even if Rakusan himself did not. Since all preview sketch prints lack separate identifying numbers, each is distinguished here by the addition of 'alt' to the Rakusan-assigned number of its corresponding final version design to emphasize the close connection between the two designs, hence 33alt is to be understood as the alternate design preview sketch for 33. 33alt would have been included as a preview announcement in the delivery installment for August 1930 (the month before the planned initial distribution of 33 in September 1930). However, 33alt and the other preview sketches had all been advance printed several months earlier - probably during the last half of 1929, and certainly no later than February 1930. The illustrated copy comes from a later-bound, center-folded album, but like all Rakusan woodblock prints, the sheet was originally distributed loose and without folds. The title-captions of the preview prints are almost always identical to those of the final version prints of the main series. However, unlike on those prints, the title-caption for a preview print was not woodblock-printed on the same sheet as the print itself. Instead it was machine-printed on a separate label which was usually glued onto the delivery envelope - and hence typically discarded with the rest of the tempororary packaging. Therefore, most labels have been lost, and no surviving copy of the label for 33alt has yet been located. The information used here is inferred from the information documented for 33. 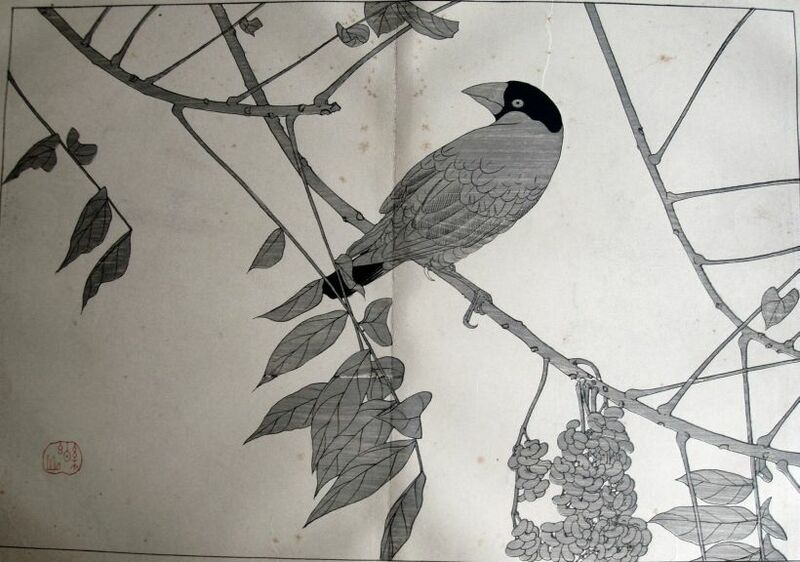 The sumac and grosbeak are the same varieties explained in more detail in the discussion of the final version of 33.